Azaleas (Rhododendron spp. ), most of which grow in U.S. Department of Agriculture plant hardiness zones 7 through 9, are a perennial favorite among homeowners due to their colorful blooms and interesting foliage; many also offer vivid fall colors. 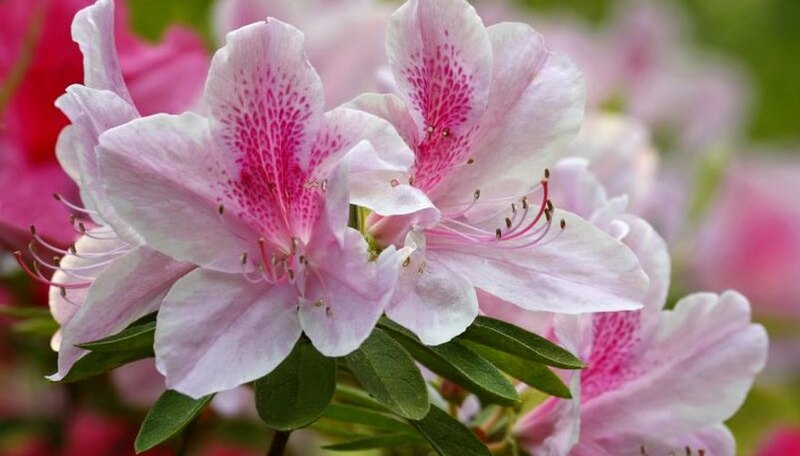 Some confusion arises when classifying azaleas, as they are in the same genus as rhododendrons. Because azaleas are closely related to rhododendrons, it is sometimes difficult for a layperson to distinguish between the two. More than a thousand described species fall into this genus; many are native to Asia, but several grow native in the United States. The plants in this genus have become a staple in nurseries and garden centers due to the demand for their showy and sometimes fragrant flowers. While most azaleas grow in USDA zones 7 through 9, many species and cultivars in the Rhododendron genus are much more cold hardy. In many cases, you can tell whether the plant in question is an azalea or rhododendron by looking at the flowers and leaves. According to the Azalea Society of America, most azaleas have only five or six stamens, while most rhododendrons have 10. The leaves of most azaleas are thinner and softer, with a more distinctive point, than those of rhododendrons. If you still can't tell, a magnifying glass can offer the solution: Azalea leaves never have scales, while the leaves of small-leaved rhododendrons always have scales. The genus Rhododendron is divided into several subgenera, sections and subsections. Azaleas, for example, are either deciduous or evergreen. Deciduous azaleas belong to the subgenus Pentanthera; evergreen azaleas belong to the subgenus Tsutsusi. Other subgenera in the Rhododendron genus, which contains the rhododendrons, include Azaleastrum, Candidastrum, Hymenanthes, Therorhodion and Mumeazalea. While the genus has over 1,000 described plants, there are more than 10,000 registered azalea cultivars due to hybridization. The difference between a species and a hybrid is that a species population interbreeds and produces true-from-seed offspring. Hybrids, on the other hand, are often selectively bred by humans, although hybridization can and does occur in nature. A species' scientific name is always the genus followed by the species; the name for southern indica azaleas, for example, is Rhododendron indica. When humans effectively create a hybrid, it is known as a cultivar, which simply means a cultivated variety. A cultivar's scientific name is usually written as genus, species, cultivar, with the cultivar name set off in quotes; for example, the "George L. Taber" azalea is most often written as Rhododendron indica "George L. Taber." This is a common, pink-bloomed cultivar that grows in USDA zones 8 and 9.